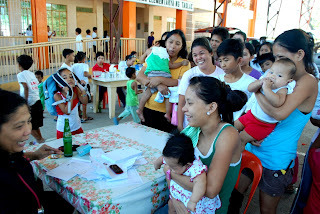 Free medicines and vitamins donated by the United Laboratories (UNILAB) and IRRI were given out. Gardenia, the largest bread bakery in the Philippines, also donated loaves of bread that were distributed by HCCRO to the families. IRRI maintains this monthly CHE and medical mission as part of the fulfillment of its social responsibility, to contribute to wellness and well-being of its partners in the communities.